This icon is created by default during XMLBlueprint installation. By default, XMLBlueprint checks the XMLBlueprint website for newer versions each time you start the application. You can modify this setting by clicking Options > Check for Updates from the menu bar. If you want, you can perform this check manually by clicking Help > Check for Updates... from the menu bar. Note: XMLBlueprint will not transmit any information about you or your system during the update process. The transaction is completely private and secure. As you use XMLBlueprint, you can press F1 at any time to obtain context-sensitive help. If you want, you can open the online help manually (and independent of the XMLBlueprint application) by clicking Start > All Apps > XMLBlueprint 15 > XMLBlueprint 15 Help. 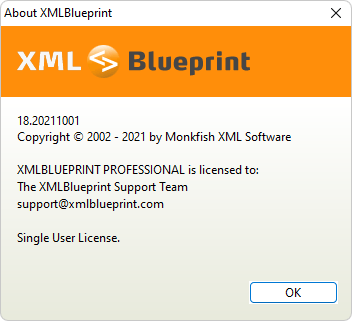 Click Help > About XMLBlueprint... to display copyright and version information.